Boulder City High School boys basketball team remains undefeated in league play after Feb. 6 and Tuesday, Feb. 12, victories over Chaparral and Sunrise Mountain, claiming its first 3A Sunrise League title since 2012. (Robert Vendettoli/Boulder City Review) Heavily defended, senior forward Derrick Thomas attempts a put-back layup against Sunrise Mountain onTuesday, Feb. 12, 2019, in the Eagles' 72-40 victory. In the 63-61 win against Chaparral, senior forward Derrick Thomas scored on a layup with 10 seconds remaining to give the Eagles their victory. Keeping his composure in the final seconds of regulation, Thomas, who finished with 16 points and eight rebounds, was confident in the Eagles’ ability to close out the win. Based on rigorous battles in the past five years, the Cowboys have become one of three rivals for the Eagles. Getting strong contributions from their starting core against the Cowboys, sophomore forward Ethan Speaker continues to blossom into a star after scoring a game-high 26 points with eight rebounds. Senior Karson Bailey added 12 points, eight rebounds and seven assists. 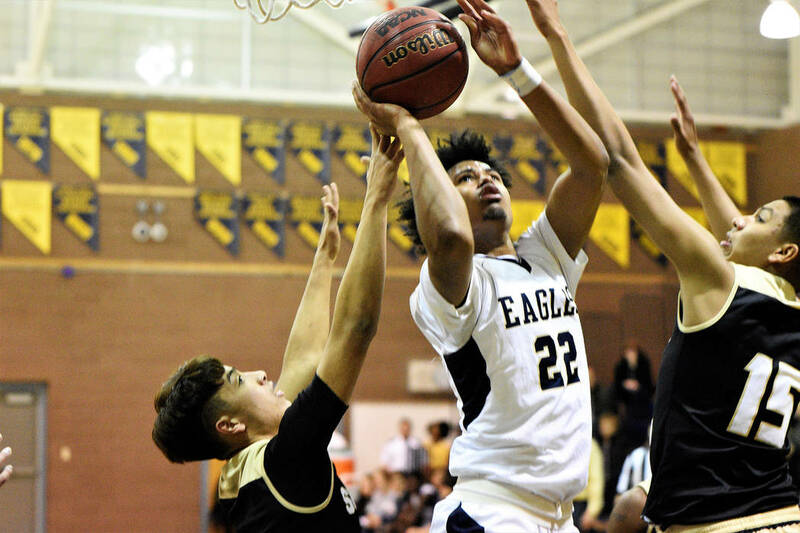 Continuing to cause problems in the paint, Speaker ran the floor relentlessly against Sunrise Mountain on Tuesday, Feb. 12, in the Eagles’ 72-40 victory, throwing down several vicious dunks, including an alley-oop in a 14-point effort. Leading all scorers, Thomas added 26 points and 13 rebounds, despite sitting out the majority of the fourth quarter. Thomas found his groove early, scoring 11 points in the first quarter including three 3-pointers during a 17-2 run. Bailey also scored in double figures against the Miners with 12 points; junior guard Gavin Balistere scored 7 points. Looking to conclude league play with a perfect 10-0 record, the Eagles will travel to rival Moapa Valley on Friday, Feb. 15. Tuesday, Feb. 19, regional playoffs vs. Western at home, 6:30 p.m.